A Bronze Sword of the Aegean-Anatolian Type in the Museum of Varna, Bulgaria. This is an English translation of a study presented to T. Soroceanu on the occasion of his 65th birthday and published originally in German in Analele Banatului 2009. We would like to wish Dr. Soroceanu good health and further stimulating scientific work. A follow-up of the present text, co-authored by M. Mehofer from the University of Vienna, will include the results and evaluation of lead-isotope and use-wear analysis, as well as publications on the topic that have appeared since 2008. L´espéecruist, ne fruisset ne nebriset. Chanson de Roland (Oxford-version), Verses 2338-2341. Almost 40 years after the first systematic contemplations on the subject of Aegean influence on Balkan swords of the second millennium BC (Sandars 1963; Hänsel 1970; Hänsel 1973), important questions such as, for example, the swords’ exact position in time, the Aegean influence visible upon them, and the manner of contacts between the Balkans and the eastern Mediterranean that contributed to the transfer of objects or ideas, are still largely unanswered. A few years ago, the fragment of a sword arrived in an unspectacular way in the Museum of Varna, a piece which nevertheless offers the opportunity to deliberate anew the relationships that existed between Anatolia, the Aegean and the Balkans during the Late Bronze Age. Unfortunately, this new find does not enable any substantial advances in the discussion, as its archaeological context is unknown, which restricts the dating possibilities considerably. Further, the sword is extremely fragmentary and, thus, does not allow exact typological comparisons. Despite these disadvantageous factors, the technical features of this high-quality weapon and traces of its use do disclose interesting points pertaining to its origins and history of utilization. It exhibits a certain similarity to the sword found in 1991 in front of the Lion Gate at the Hittite capital of Hattuša, which bears an inscription in Akkadian. This likeness lead to reflections about the route of influences from the south to the eastern Balkans, the functions of Late Bronze Age swords in Southeast Europe, and also the possibility that these swords were handed down as heirlooms from generation to generation. In the year 2000 the fragment of a sword blade (Inv.No. I-3762) was donated to the Varna Museum, which according to the donor, a resident of the town of Šumen, was allegedly found in Northeastern Bulgaria (Figs. 1 and 2).Although the site cannot be pinpointed precisely, there is some certainty about its general location in the region; moreover, it can be definitely stated that the fragment was not purchased from abroad. This certainty is supported by the circumstance that at the same time of this donation, a whole series of prehistoric metal objects, verifiably found in Bulgaria, was offered for purchase to museums in Northeastern Bulgaria. Dealers in antiquities at that time did not dispose over a broader range of possible markets; they were, instead, far more dependent upon looted goods from local illicit excavations. As this particular sword fragment apparently seemed a relatively worthless single piece to the dealer, it was given as a gift to the Museum in connection with a larger acquisition of objects, which were of later date. This circumstance as well clearly points to a local provenience of the sword fragment, which the dealer could not possibly have purchased; for in such a case he would have attempted to regain at least the price that he himself paid for it. The object of discussion is the fragment of a sword with middle rib and a blade that narrows gradually from the hilt plate to the tip (Figs. 2, 3 and 4.1). The blade is broken at its upper and lower end, and measures 18.7 cm in length. The beginning of the hilt plate is preserved, on which the remnants of at least three rivet holes can be recognised. A fourth hole can be reconstructed symmetrically. Through this the sword can be addressed as a flat-hilted sword (Griffplattenschwert) or perhaps even a flange-hilted sword (Griffzungenschwert). The rivets were located relatively high on the hafting plate, indicating that the organic covering material of the grip was not well fastened, thus allowing the presumption of the presence of one or even two additional rivets in the flange. The diameter of the rivet holes can be reconstructed as 0.55 cm each, whereby the distance between the two central holes is 0.75 cm. At the hilt plate the blade has a width of 5.2 cm and a thickness of 0.9 cm that decreases to 0.3 cm at the break. At the lower end the blade has a width of 2.5 cm and a considerable thickness of 1.1 cm, due to the middle rib. The middle rib with oval cross section is accompanied to the right and left by four small, sharply edged ribs running along the entire length of the preserved blade. Towards the hilt the outermost rib on each side divides into two single ribs, which fan outwards, so that the total number of ribs on each side amounts to twelve, and together with the middle rib thirteen. The number of ribs decreases towards the tip of the narrowing blade. Thus, in the lower part of the sword fragment, about 20 cm below the hilt, only three ribs can be observed to the left and to the right of the middle rib. It can be assumed that the number of ribs at the tip declines further, probably to one rib on each side of the middle rib. The entire blade is rhomboid in cross-section, while the area of the hilt it is somewhat flatter. The sword is in a relatively poor state of preservation. Aside from its fragmentary condition, there are a number of notches on the blade, which in the case of the otherwise well preserved surface indicate that the weapon had been long in use. Damages with a length of 2–2.5 cm can be noted on both sides of the middle rib and on the upper parts of the decorative ribs, about 2 cm above the lower end of the blade. These damages clearly did not occur in battle, judging from their large surface area as well as the fact that both sides of the blade suffered the same. It appears either that the sword was set upon an anvil-like underground and struck with a hard object, or that – less likely – it was placed in a rock crevice, which acted like a pliers and then folded. Although the scene with a crevice seems tempting to believe in view of analogies with the archetype medieval sword Excalibur, the damages on both sides of the Varna sword blade are too alike and too regular to have been caused by insertion in a rock crack. Furthermore, had the grip been bent vigorously, then the sword should have broken above the spot damaged by the rock and not below, as is here the case. However, the fact that the blade broke due to extreme bending about 20 cm below the grip, that is, above the presumed middle part of the blade, can be recognised at the blade’s end, which is bent at ca. 70. The aforementioned scrapes on both sides are not necessarily associated with the breaking of the blade. All of the damages are covered with a fine, greenish brown patina, which is indicative of their antiquity. The other parts of the blade are also corroded, but shiny. A borderline of the patina in the area of the hilt, which might point to the form of the lower part of the grip’s covering material, cannot be distinguished. Apart from the damages mentioned above, the surface is even and well finished. Concerning techniques involved in the production of the sword, without having conducted special examinations it can only be stated that casting was carried out using a bi-valve mould; thereby, the decorative ribs in each valve did not correspond exactly. The absence of the grip zone and a large part of the hilt plate hinders an exact formal assignment, for these parts in particular are determinant for identifying the type of sword. The position of the rivet holes indicates that the form of the hilt is like that which is characteristic of Aegean flange-hilted swords (Griffzungenschwerter). The corresponding angular shoulders can be reconstructed, from which the relatively wide tongue developed. The rather high placement of the rivets on the shoulder has no parallels on swords in Bulgaria until now. The closest analogy for the form of the hilt known to us is found on the sword from Roşiori de Vede (Fig. 4.4), which likewise bears four rivets placed high on the hilt plate (Bader 1991, 31 Nr. 21). Yet, cut marks on the hilt and grip tongue as well as the fact that the bundle of grooves that run up to the rivet holes are dubious, which would signify secondary alteration of the sword (Bader 1991, 31; Kilian-Dirlmeier 1993, 31). Remarkably, the flatter rhomboid cross-section of the blade of the Romanian weapon resembles that of the sword in the Varna Museum. In spite of the observation that neither the blade form nor the middle rib comply with those that determine Aegean sword types (Kilian-Dirlmeier 1993, 32; 94), in the following parallels will be sought for the numerous ribs on the characteristically formed Varna blade. The characteristic profile of the blade displays great similarity to the sword that was discovered in 1991 at the Lion Gate in the Hittite capital of Hattuša, near present-day Boğazkale, province of Çorum (Fig. 4.2; Ertekin/Ediz 1993; Müller-Karpe 1994, 434; O. Hansen 1994; Cline 1996; Cline 2008; S. Hansen 2005). This find is noteworthy above all because of the inscription in the Akkadian language upon it. According to the reading by A. Ünal, the text is as follows: “When Tudhaliya the Great King shattered the Aššuwa-Country, he dedicated these swords to the Storm-God, his Lord.” (Translation from Cline 2008; Müller-Karpe 1994, 435). Whereas the Anatolian sword has four ribs that reach to the hilt, the number of ribs on the Varna sword multiplies as they rise. However, the primary formula in the imagery of ribs that fan out as they go upwards, lending a floral, lilly-like character to the blade, is exactly the same on both swords. Solely the placement of rivet holes on the hilt is organised somewhat differently. Whereas the sword from Hattuša has two rivet holes in the shoulders and one in the centre at the transition to the grip tongue, a row of four holes can be reconstructed on the hilt of the Varna fragment. The rivet holes in both swords were driven into the hilt by a punch after casting, as the ridges on each side reveal. In view of the form of the grip tongue and the hilt, the sword from Hattuša can be assigned typologically near Karo type B, which is characterised by angular shoulders. Nonetheless, the marked profile of the blade allows it to be distinguished as an independent type, hitherto known only in examples in Hattuša and the fragment in Varna Museum. Particularly the elaborate decoration of the blade with several ribs sets both pieces clearly apart from all other types of swords and renders them as special weapons. Interestingly, the motif of ribs that curve outwards towards the hilt also appears on the fragment of the golden sword in the hoard from Peršinari, which – basing on its material alone – can be considered an extravagant showpiece (Fig. 4.3; Bader 1991, No. 20). Nevertheless, the date of the sword from Peršinari is still a matter of great debate. After a temporal assignment that started with the Mycenaean period (Cp. Mozsolics 1968, 5-10; Kilian 1976) came an earlier date to the third millennium BC, a proposal that bases mainly on the silver shaft hole axes found in the same hoard (Vulpe 1995; Born/Hansen 2001, 40).A decoration similar to that on the Varna fragment can be observed on a sword from the island of Ithaka, which also has a strongly profiled blade (Fig. 4.5; Kilian-Dirlmeier 1993, No. 40).The blade has a wide middle rib with decorative ridges in the middle and on both sides. These likewise curve outwards towards the hilt. However, this sword displays a fundamentally different method of shafting by means of two rivet holes located below the now missing shoulders, but still on the hilt plate. The blade also differs through its short grip tang, which has a rivet hole. The preserved part of the transition from tang to the shoulders insinuates that this piece had rounded shoulders, a feature that sets this sword near Karo type A. Admittedly, the decorative grooves, some curved outwards like a funnel, are found on central and west European flat-hilted swords (Griffplattenschwerter) and solid-hilted daggers (Vollgriffdolche). Gentle decorative ribs distinguish a sword from “Pella” (Kilian-Dirlmeier 1993, No. 444) and further thrust weapons of the Apa type, found in the Carpathian Basin (Cp. Hundt 1970, Fig. 1 and 2.1-4, 5). One argument for the weapon’s origin in a hoard from the west Black Sea area is the fragmentation of the sword. This ruination denotes a ritual practice that is generally typical for the continental European Late Bronze Age and Urnfield Culture (Nebelsick 2000), especially for the area of the lower Danube River. Although swords were often made useless by bending them, before they were deposited in the earth, the complete folding of the blade is rarely attested. Yet, particularly in the region in question here this action can be considered characteristic. In the hoard finds of Sokol (dist. Silistra) and Ovča Mogila (dist. Svištov), for example, one sword of the Mycenaean type each was deposited together with other metal objects, whose form can be seen as indigenous. Along with the sword, the hoard in Sokol contained fifteen complete socketed axes and or fragments thereof, 130 whole or fragmented sickles, one dagger, a saw blade, the fragment of a knife blade, casting remains and fragments of a metal platter (Панайотов-Доневски 1977). The best anchor for dating the sword fragment in the Varna Museum is presented by the Aššuwa sword from Hattuša, especially as it is typologically the closest. The name Tudhalija in the inscription on the Aššuwa sword is dated mostly towards the end of the 15th century, which provides a clear fixed point for the deposition of the sword (Müller-Karpe 1994, 435-436; Cline 1996). Assuming that the conflict of the Great King with the Aššuwa, also mentioned in the inscription, was carried out with contemporary weapons, then we have here a sword of the 15th century BC. Yet as the sword was dedicated after the victorious battle, it was not a weapon of the Hittites, but rather that of their opponents (Müller-Karpe 1994, 436; O. Hansen 1994; S. Hansen 2005, 89-90).Although the geographic location of the country cannot be pinpointed exactly, until now there has been no doubt that the land of the Aššuwa lay in Northwestern Anatolia (Müller-Karpe 1994, 436-437; Cline 1996. ).Similarly, as a Hittite provenience of the Hattuša sword can be excluded, it can be propounded that most probably the fragment in the Varna Museum did not derive from the Balkan region, as until now no comparable weapons have been found in there. It is indeed remarkable that the presumed discovery site of the Varna sword lies equally as far from Northwestern Anatolia as from the Hittite capital. Whereas the text inscribed in the sword from Boğazkale informs us about the reasons for its deposition, the motives behind the Varna sword’s journey to the north are still vague. The foreseen metallurgical examination of the fragment will surely lead to more information. The extreme stress exacted upon the blade makes obvious that the sword was long in use prior to its final destruction and deposition. The problematic dating of the extraordinary sword in the hoard from Perşinari was already addressed above. The production of this gold weapon as early as the Early Bronze Age is, nonetheless, difficult to imagine, as then it would have preceded the entire typological development of Aegean-Anatolian swords. Furthermore, when judged alone, this splendid sword is difficult to date: The Varna fragment is the only form known until now that displays a distant relatedness to it, thus, forming a link between the sword from Perşinari and Hattuša. The other components of the Perşinari hoard, such as the golden daggers and the fragments of silver axes, are obviously older and can be dated basing on sound arguments to the end of the third millennium BC. (Born/Hansen 2001, 39-41). However, it is worth noting that there are no known discoveries of such swords, especially of this size, in Europe from that early time. The few Early Bronze Age daggers found in Greece are either not dated or – in view of their size – are hardly comparable.Hence, a later date must be assumed for the Perşinari sword, which based on the characteristic form of the hilt, even though the hilt was attached secondarily (Vulpe 1995, 46-47), is still the best link with the Shaft Graves (Cp. Kilian 1976), or it even dates as late as Late Helladic II (Mozsolics 1968, 5-10; Müller-Karpe 1994, 437-438). At first one must become accustomed with the idea that splendid weapons such as the silver axes were handed down over seven centuries’ time. Nevertheless, it is hardly possible that swords with a hilt like that in Perşinari appeared one-half millennium earlier than the sword types Karo A and B in the Aegean. Consequently, we must take as a fact that there are two categories of finds, each of different date, in the hoard: one group that belongs to the Early Bronze Age and the other to the Late Bronze Age (according to Aegean terminology). Yet, a seemingly large discrepancy in date between the swords and the other hoard components is likewise notable in other depositions found in the lower Danube area, a situation which has been explained as the long-term use of the swords, even into the Late Bronze Age. Possibly they were preserved as relics/heirlooms, before they were deposited in the earth along with other objects. The composition of hoards themselves is only a limited aid in dating the swords; it only informs us about the time of deposition, but not about the production and use of the weapons. If we approach Varna sword from the point of view of its similarity to the Aššuwa sword, then the Varna sword must be assigned to the 15th century BC (Fig. 7).However, the time span cannot be further delimited, for the sword from Hattuša along with related sword types were, with great certainty, in use both before as well as after the Aššuwa revolt against the Hittite great king. So, we reach a date in the 15th–14th century BC or in Late Helladic II–Late Helladic IIIA. Yet, the possibility of a later dating should not be excluded. Observing, for example, the hoards from Pobit Kamăk, Sokol, Ovča Mogila and Drajno de Jos, we find swords deposited together with objects, all of which are significantly younger than the Aššuwa sword and which can be assigned only later to Late Helladic IIIB–Late Helladic IIIC, or to hoard phase I and II, according to B. Hänsel (Hänsel 1976, 25-47).On the other hand, a significant continuance of the horned swords (Type C according to Sandars 1961) on the Balkan Peninsula as opposed to Aegean types can be drawn into consideration (Hänsel 1970, 30-32; Kilian-Dirlmeier 1993, 51-53). In this reference, the hoard from Vărbica II, which contains an Early Bronze Age shaft-hole axe (Ковачева 1967, Abb. 5,5), deposited together with socketed axes and the fragment of a Naue-II sword, Hänsel’s hoard phase II (Lesura-Vărbica), is quite elucidatory (Hänsel 1970, 36; 1976, 39). An additional argument in favour of the eventually longer circulation of swords north of the Aegean is found in the greater extent of use-wear observable on them, in contrast to those found in Greece, a factor that – of course – might also be due to the circumstance that Aegean swords were found predominantly in graves, whereas Balkan swords derive mostly from hoards. 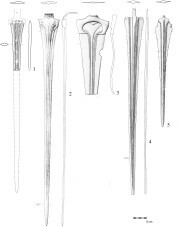 The sword from Roşiori de Vede is a single find and has been assigned by Bader by means of typological comparison to Karo’s type B, as defined by finds in the Shaft Graves at Mycenae (Bader 1991, 31-33). Yet, this dating provides merely a coarse orientation, because, firstly, the similarities of the sword from Roşiori de Vedewith Mycenaean weapons are quite minimal, and, secondly, the Varna fragment differs distinctly from both. The secondary alteration of the hilt makes any decision as to whether it is an older or a younger representative of Karo B-swords impossible, and, thus, despite the formal agreement in the blade decoration it does not contribute to dating the find in Varna Museum; it can only be placed generally in an interval of time of the Mycenaean Shaft Graves, until Late Helladic IIIA.All together, the reworking of the hilt of the sword from Roşiori de Vede, like the secondary cast solid hilt of the example from Copşa Mare, and – above all – the hilt attached later to the sword from Perşinari are signs of the longer period of use of swords in the Balkan area. Individual examples of the appearance of older swords in younger find contexts can also be pointed out in the Aegean. Here to mention is the sword from a shaft grave at Staphylos on the island Skopelos. The grave dates to Late Helladic IIB, with exact counterparts in Shaft Grave IV and V in Mycenae (Kilian-Dirlmeier 1993, 36). KEIMHΛIA (Treasures) in the Second Millennium BC Balkans? It is indeed worthwhile to deliberate why swords in the Balkan area were in use for such a long time, before they became part of the archaeological record. It is peculiar that most examples of older swords were found in younger find contexts, located areas in which graves containing weapons are not present, that is, in the zone north of Epirus, Macedonia and the Rhodope Mountains. The absence of richly furnished warrior graves as well as of important central localities with fortifications or at least multilayered settlements, in which a highly stratified society could be expected, hampers the interpretation of practices there with metal weapons and does not enable comparisons with examples of the continued use of older objects that are described in literature. During the second millennium BC on the eastern Balkan Peninsula the image of a society emerges, which with one sole exception – the use of metals – can be called egalitarian. The convincing interpretation of prestigious goods of the late Hallstatt- and early Latène period in western Central Europe, designated by Fr. Fischer with the ancient Greek term “κειμήλιον”, connoting ‘gift’, but also ‘relic’ (Fischer 1973), does not aid in understanding conditions in the eastern Balkan Peninsula, as no distinguishable elite group can be testified there, which resembles the Homeric heroes or the late Hallstatt and Latène rulers, who exchanged and accumulated precious goods and established their authority with these possessions (Ulf 1990, 234). However, what is the explanation for the presence of relics/heirlooms in societies, for whom lengthy settlement in one location (tell settlements were abandoned at the end of the Early Bronze Age), the development of large cemeteries and the erection of monumental memorials were foreign? Valuable metal artefacts were in use on the eastern Balkan Peninsula for a very long time, and apparently were handed down for a period longer than one human lifetime. Only with the appearance of the custom of deposition were they placed in the ground. Although not comparable in structure, but in the temporality of its use, perhaps the circulation of shell jewellery on the island of Gawa, Papua-New Guinea, can be viewed in analogy (Leach 1983). The valuable objects were the personal property of one individual only for a specific time. They are handed down continuously, and they are never deposited in the earth. This kind of ceremonial exchange does not leave behind any traces in the ground and, thus, cannot be confirmed archaeologically. Therefore, an ethnographic comparison is tempting, because society on Gawa is acephalic without any obvious leading personalities. Prestigious valuables are known on Papua-New Guinea, but there again they too are the personal property of an individual only for a limited time and are exchanged later according to strict regulations (Leach 1983). This ethnographic comparison need not be followed further, as it is difficult to imagine that concealed behind the changing of swords lay the regulated exchange of foodstuffs and maintaining social contacts (Munn 1986, 42–44). Possibly the time has now come to abandon the concept that the owners of Balkan swords had any resemblance to the rulers buried in Mycenaean Shaft Graves or to persons in richly furnished burials in Epirus and the Rhodope Mountains. In view of the limited amount of source material on the Late Bronze Age in the Balkan region, it is indeed risky to search afar for an interpretation of the passing down of swords from one generation to the next. Here it is suggested that possibly the basis of this custom might be sought in a social structure that differed fundamentally from that in the Aegean world, or, in other words, in the absence of a marked elite. Probably males with great influence and prestige owned these weapons for a specified time or even their whole life. Upon their death the valuable objects were then passed on to their children or to other members of society. Until a comprehensive analysis of isotopic position of swords in the Aegean, Anatolia and the Balkan Peninsula is carried out, the question as to whether the Varna sword was imported or whether it was the product of a local craftsman and only displays Aegean-Anatolian influences, cannot be answered conclusively. In view of the typological correspondences with the sword from Hattuša, it is quite possible that the Varna fragment was imported directly from the land of the Aššuwa, that is, from Northwestern Anatolia. Nonetheless, the Aššuwa sword was doubtlessly influenced by Aegean weapons (Müller-Karpe 1994, 437), although neither the example found in the Hittite capital nor the Varna fragment can be deemed direct imports from the Greek mainland. Be that as it may, the question of whether they were imports or imitations is not of fundamental significance, as both cases presuppose contacts between the Aegean and the eastern Balkans, which enabled either the exchange of wares or the transfer of ideas. Even if the fragments are local products, the smiths had an imported sword in mind or – less likely – they themselves came from Northwestern Anatolia or at least had lived there for a longer time. And if the fragments are indeed local products, it would be of interest to localise the site of its production. Potential options here would be the area around Pobit Kamăk in Northeastern Bulgaria (Черных 1978, 254-257) or a workshop in Transylvania (Mozsolics 1973, 84-86; Bader 1991, 30). Some factors that support a local origin of the gold sword from Perşinari is its conceptual similarity in execution to the Varna fragment, especially in view of the decorative ribs, for which no close parallels in the Aegean sphere exist. Due to the present situation of source material, no statement can be made as to whether the flattish rhomboid cross-section of the blade is characteristic for the eastern Balkan area or for Northwestern Anatolia. In any case, the sword fragment from Roşiori de Vede shows a similar cross-section. Moreover, important for answering the question concerning the site and manner of production of the Varna sword, is the observation made by A. Mozsolics and T. Bader, according to which those finds from the Carpathian Basin that are viewed as displaying Aegean influence are of far better quality, that is, they exhibit better workmanship than other metal objects of that epoch (Bader 1991, 28; Mozsolics 1967, 58).This more qualitative workmanship in production can be observed on the example from Varna: Its surface is considerably smoother than that of other bronze objects of the second millennium BC, which we were able to view in Bulgarian and Romanian museums. However, the theory that the high-quality swords found in the Balkan region originated from Northwestern Anatolia is, nevertheless, a conclusion ex silentio, a result that bases solely upon the scarcely known typological development of bronze swords in that region. Hence, it would be a mistake to declare all of the different forms of swords that have no exact analogies in the Aegean world as northwest Anatolian. Until the results of chemical analyses are presented, it can only be conjectured that the origin of the Varna fragment and perhaps the golden sword from Perşinari was Asia Minor. Due to the present state of knowledge about cultural development during the Late Bronze Age in this region, there are no facts that would support any other explanations for the differences in quality, such as the swords’ production in different workshops that made ‘normal’ weapons for common use, on one hand, and ‘ostentatious’ weapons for the elite, on the other. Of interest, lastly, is the question as to how a sword that strongly resembles a weapon that the Hittite great king dedicated in the capital of his kingdom after a victorious battle, could arrive in a cultural milieu, in which imports from the Bronze Age centres of the Mediterranean sphere are extremely rare. Taking solely Aegean or Aegean-influenced finds reported in the eastern Balkan region as measure, the strict application of the categories ‘center’, ‘periphery’ and ‘margin’ would not even qualify this region as periphery.Ultimately, the role that finally came to the sword within the setting of its final phase of use cannot be clarified, due to the poor state of research on the second millennium BC in the eastern Balkans (Harding 1993).One reason for this unfortunate state of resources is certainly to be sought in the change in settlement structure in the area between the Rhodope and Carpathian mountains, a time when settlement mounds were abandoned and the few known flatland settlements never consist of more than three to four building phases. The detection of thin habitation layers at settlement sites that are difficult to localise to begin with is a methodical problem in this area: Aside from one or two exceptions, until now no intensive archaeological prospection has been conducted there. This is exacerbated by the absence of larger cemeteries in eastern Bulgaria and Romania, one of the least researched parts of the European continent with regard to the Late Bronze Age.For this reason it still not possible today to undertake the precise dating for important categories of finds, such as double axes (Buchholz 1983; S. Hansen 2005, 93), lance- and arrowheads (Черных 1978, 163, 228, 232), sceptres with an inward rolled tip (S. Hansen 2005, 93-94; Василева 2008), and ox-hide ingots (S. Hansen 2005, 93; Leshtakov 2007), categories which play a role in discussions about contacts between the eastern Balkan area and the Mediterranean sphere. Thus, the question still remains as to whether the sceptre that was retrieved from the shipwreck at Uluburun and dated to an interval at the end of the 14th century BC represents a new stage of contacts between the Balkan region and the eastern Mediterranean, or should the movement of objects from the north to centres in the Levant be reassigned earlier to the 15th century BC, the time of the swords from Hattuša and the one in the Varna Museum. As a consequence to the poor state of research in the eastern Balkan region, the impression has arisen that there is a distinct cultural boundary between Northwestern Anatolia and Southeastern Thrace. The contrast is greatened when considering the westernmost excavated urban centre in Anatolia, the hill of Hissarlık (Troy) on the Dardanelles, a site which on account of its geographic location was essentially predestined as participant in the transfer of prestige goods to the Balkans. Astonishingly, prior to the phase Troy VIIb there are practically no signs of trade or any kind of relations with Southeastern Thrace. In this reference a comparison would be worthwhile with Greek-Macedonia, a region that lays a few hundred kilometres west of the Dardanelles and has been far better researched than Southeastern Thrace. Present in Greek-Macedonia are rather rural settlements, among others, Kastanas, Agios Mamas, Assiros and the Toumba Thessalonikis, all of which are much smaller than Troy and have no monumental buildings or fortifications, yet which offer significantly more information about contacts to the north (Horejs 2005; ibid. 2007 with cited literature). Evidently, the social and economic structures of settlements in the northern Aegean resemble those in the inner Balkan Peninsula more, through which a certain reciprocity as basis for the exchange of good scan be first attained.The absence of such reciprocity does not mean that a stock raiser from the inner Thrace did not care to own any trade products from Troy, and, oppositely, that no foodstuffs and other natural products from isolated rural regions did not reach the Trojan palace on the Dardanelles. As historical and ethnographical observations have shown, this kind of trafficking wares does not occur via a direct route, for which the lack of reciprocity is not the single factor. It occurs through the mediation of participants in trade, who occupy an economic and social middle position. In the case of Southeastern Thrace, however, it is precisely these mediators that are lacking, that is, they have not been archaeologically attested until now. Paradoxically, the existence of the fortified settlement of Troy is the most contradictory sign of an existent economic-social border between Anatolia and the eastern Balkan area during a substantial part of the second millennium BC. The impressive contrast between a fortified urban complex with massive stone architecture, on the one side, and, on the other, thin-layered settlements with houses built of wattle and daub in Thrace (Özdoğan 2003, 355) shows that this northwest Anatolian centre itself was located at the edge of a cultural sphere. Troy’s location near the Dardanelles alone does not allow its designation as ‘end-station’, but rather as ‘intermediary station’ (Hänsel 2003, 109). The role that the fortress played in the exchange of goods between the eastern Balkans and western Anatolia cannot be substantiated here: There is no archaeological evidence at hand for a discussion of its role as a crossroads or a bridgehead between Asia and Europe.Nonetheless, the economic-social border as marked by Troy may not be understood as a line of division, for example, like the Iron Curtain. It is far more to be seen as a transition- or boundary zone, in which elements of both worlds are present to different degrees. Even if the border were created and maintained by an authoritative and complex socio-political institution, it could nevertheless elude the control of the central body.That this was a transfer- and contact zone at the geographic border between Anatolia and the Balkans during the Late Bronze Age is attested by the hoard of Tekirdağ, an impressive example of the encounter of objects of Anatolian, Aegean and Balkan origin (Hansen 2005, 90-93). Whether a similar circulation of metal objects across the Sea of Marmara existed at the time of the swords from Hattuša and Varna cannot be stated, due to the lack of hoards from this time. Pottery found at the site of Vratica 1 (located ca. 30 km west-northwest of the harbour town of Burgas and ca. 280 km north of the Dardanelles), which has analogies in Troy VI, is the first evidence known to us of contact or distinct influence between Eastern Thrace and Northwestern Anatolia: namely, concerned here are common everyday objects and not weapons or luxury goods. Let us return to the question of how such a splendid weapon, whose counterpart was dedicated to a deity by no one less than the great Hittite king, could arrive in an eastern Balkan environment of presumably egalitarian and relatively isolated communities. Without striving for negative evidence, it can be said that basing on the above mentioned economicand social differences between the participating groups we have to do here with a sporadic form of exchange, in which very little information was passed on between the participants.From a northwest Anatolian viewpoint the grounds for this “silent trade”, using C. Renfrew’s terms, are of geopolitical nature, as the interests of Troy and Aššuwa were probably solely directed towards the great political powers in the south and southwest.From a perspective view of the eastern Balkan Peninsula, economic and social factors surely played a role, for evidently situated there were mostly self-limited communities that lived in short-term settlements with a minimal population density. The verse cited in the introduction pertains to the dying Roland, who attempted to destroy his sword Durandal on a rock, in order that the valuable weapon that brought him countless victories would not fall into the hands of the enemy. Roland strikes the sword so strongly against the rock that it bounces away and flies to heaven. Durandal is of divine origin, because an angel gave the sword to Charlemagne, who in turn gave it to Roland; hence, the dying warrior’s attempt to destroy the sword and its flight into the heavens can be understood as the return of the sword to the gods. There are relics in the sword’s grip that imbue the weapon with invincibility; they also extend its history into the past. The history of the sword of Roland, which was written down 25 centuries after the ‘lifetime’ of the sword in the Varna Museum, brings us to one of the most serious interpretative difficulties associated with sword finds of the second millennium BC on the Balkan Peninsula. The problem does not lie in the difficulty of verifying that these valuable weapons were destroyed in order to be offered to the gods and through that to emphasise their supernatural origin as well as the social status of their owner. Nor does the problem lie in the lack of knowledge about the history of the swords, which although their grip did not carry relics, were nevertheless in use for a lengthy time and handed down from generation to generation. Indeed, the problem roots in the absence of the hero, who represented the elite, whose prestige and fame could be linked with the qualities and ‘biographies’ of the rare weapons. We can only understand what the social and ideological function of the swords during the second millennium BC in the eastern Balkans was, when the view of the researcher shifts from easily localised and attractive settlement mounds of the Neolithic, Chalcolithic and Early Bronze Age to undertaking intensive archaeological field surveys, which would contribute to consolidating the picture of archaeological finds of the Middle and Late Bronze Age. Bader, T. 1991. Die Schwerter in Rumänien. Prähistorische Bronzefunde IV,8. Stuttgart. Bintliff, J. 1999. “Settlement and Territory”. In: G. Barker (ed. ), Companion Encyclopaedia of Archaeology, Vol. 1: 505-545. London. Blegen, C., J. Caskey and M. Rawson 1953. Troy Vol. III. The Sixth Settlement. Princeton. Born H., and S. Hansen 2001. Helme und Waffen Alteuropas. Sammlung Axel Guttmann IX. Mainz am Rhein. Bourdieu, P. 1990. The Logic of Practice. Stanford. Buchholz, H.-G. 1983. “Doppeläxte und die Frage der Balkanbeziehungen des ägäischen Kulturkreises.” In: A. G. Poutler (ed. ), Ancient Bulgaria I, 43-134. Nottingham. Cline, E. 1996. “Aššuwa and the Achaeans: the ‘Mycenaean’ Sword at Hattušas and its possible Implications.” Annual BSA 91, 1996, 137-151. Cline, E. 2008. “Sword (Catalogue Entry 292).” In: J. Aruz, K. Benzel, and J. M. Evans (eds. ), Beyond Babylon. Art, Trade and Diplomacy in the Second Millennium B.C., 444. New York. Dyson-Hudson, R. and S. Alden 1978. “Human Territoriality: an Ecological Reassessment.” American Anthropologist 80, 1978, 21-41. Easton, D. F., J. D. Hawkins, A. G. Sherratt, and E. S. Sherratt 2002. “Troy in Recent Perspective.” Anatolian Studies 52, 2002, 75-109. Ertekin, A. and I. Erdiz 1993. “The unique Sword from Boğazköy/Hattuša.” In: M.J. Mellink, E. Porada, and T. Özgüç (eds. ), Aspects of Art and Iconography: Anatolia and its Neighbors. Ankara. Fischer, Fr. 1973. “ΚΕΙΜΗΛΙΑ. Bemerkungen zur kulturgeschichtlichen Interpretation des sogenannten Südimports in der späten Hallstatt- und früher Latène-Kultur des westlichen Mitteleuropa.” Germania 51, 1973, 436-459. Guichonnet, P. and C. Raffestin 1974. Géographie des frontiers. Paris. Hänsel, B. 1970. “Bronzene Griffzungenschwerter aus Bulgarien.” Prähist. Zeitschr. 45, 1970, 26-41. Hänsel, B. 1973. “Eine datierte Rapierklinge mykenischen Typs von der unteren Donau.” Prähist. Zeitschr. 48, 1973, 200-206. Hänsel, B. 1976. Beiträge zur regionalen und chronologischen Gliederung der älterenHallstattzeit an der unterenDonau. Bonn. Hänsel, B. 1997. “Gaben an die Götter – Schätze der Bronzezeit Europas, eine Einführung.” In: A. Hänsel und Hänsel, B. (eds. ), Gaben an die Götter – Schätze der Bronzezeit Europas, 11-22. Berlin. Hänsel, B. 2003. “Troia im Tausch- und Handelsverkehr der Ägäis oder Troia ein Handelsplatz?” In: Ch. Ulf (ed. ), Der neue Streit um Troia. Eine Bilanz. 105-119. München. Hansen, O. 1994. “A Mycenaean Sword from Boğazköy-Hattuša found in 1991.” Annual BSA 89, 1994, 213-215. Hansen, S. 1994. Studien zu den Metalldeponierungen während der älteren Urnenfelderzeit zwischen Rhônetal und Karpatenbecken. Bonn. Hansen, S. 2005. “Neue Forschungen zur Metallurgie der Bronzezeit in Südosteuropa.” In: Ü. Yalçin (ed. ), Anatolian Metal III. Der Anschnitt, Beiheft 18, 89-103. Bochum. Harding, A. 1993. “Europe and the Mediterranean in the Bronze Age: Cores and Peripheries.” In: Chr. Scarre, and F. Healy (eds), Trade and Exchange in Prehistoric Europe. Conference Bristol 1992, 153-160. Oxford. Horejs, B. 2005. “Kochen am Schnittpunkt der Kulturen – zwischen Karpatenbecken und Ägäis.” In: B. Horejs, R. Jung, E. Kaiser, and B. Teržan (eds. ), Interpretationsraum Bronzezeit. Festschrift B. Hänsel. Univforsch. Prähist. Arch. 121, 71-94. Bonn. Horejs, B. 2007. Das prähistorische Olynth. Die Ausgrabungen in der Toumba Agios Mamas 1994-1996. Die spätbronzezeitliche handgemachte Keramik der Schichten 13 bis 1. Rahden. Hristova, R. 2011. “Late Bronze Age Pottery from the Site of Vratitsa, Eastern Bulgaria: Definition, Chronology and its Aegean affinities.” In: B. Horejs and P. Pavúk (eds. ), Aegean and Balkan Prehistory. http://www.aegeobalkanprehistory.net/article.php?id_art=19 (29 Feb. 2012). Hundt, H-J. 1970. “Verzierte Dolche der Otomani-Kultur.” Jahrbuch RGZM 17, 1970, 35-55. Kilian-Dirlmeier, I. 1993. Die Schwerter in Griechenland (außerhalb der Peloponnes), Bulgarien und Albanien. Prähistorische Bronzefunde IV,12. Stuttgart. Krauß, R. 2005. “Der Depotfund von Ovča Mogila, Kreis Svištov (Bulgarien): Zur Datierung der Bronzehorte von der unteren Donau über mykenische Schwerter.” In: B. Horejs et al. (eds. ), Interpretationsraum Bronzezeit. Festschrift für Bernhard Hänsel. Univforsch. Prähist. Arch. 121, 199-210. Bonn. Leach, J. W. 1983. “Introduction.” In: J. W. Leach and E. Leach (eds. ), The Kula. New Perspectives on Massim Exchange, 1-26. Cambridge. Leshtakov, K. 2007. “The Eastern Balkans in the Aegean Economic System During the LBA. Ox-Hide and Bun Ingots in Bulgarian Lands.” In: I. Galanaki, H. Tomas, Y. Galanakis, and R. Laffineur (eds. ), Between the Aegean and the Baltic Seas. Prehistory Across Borders. Conference Zagreb 2005. AEGAEUM 27, 447-458. Liège. Mozsolics, A. 1967. Bronzefunde des Karpatenbeckens. Depotfundhorizonte von Hajdúsámson und Kosziderpadlás. Budapest. Mozsolics, A. 1968. “Goldfunde des Depotfundhorizontes von Hajdúsámson.” Ber. RGK 46-47, 1965-1966 (1968) 1-73. Mozsolics, A. 1973. Bronze- und Goldfunde des Karpatenbeckens. Depotfundhorizonte von Forró und Ópályi. Budapest. Müller-Karpe, A. 1994. “Anatolische Bronzeschwerter und Südosteuropa.” In: C. Dobiat (ed. ), Festschrift für Otto-Herman Frey, Marburger Studien zur Vor- und Frühgeschichte Band 16, 431-444. Marburg. Munn, N. 1986. The Fame of Gawa. A symbolic Study of Value Transformation in a Massim (Papua New Guinea Society). London. Nebelsick, L. 1997. “Auf Biegen und Brechen. Ekstatische Elemente bronzezeitlicher Materialopfer – Ein Deutungsversuch.” In: A. Hänsel and B. Hänsel (eds. ), Gaben an die Götter – Schätze der Bronzezeit, 35-41. Berlin. Nebelsick, L. 2000. “Rent Asunder: Ritual Violence in Late Bronze Age Hoards.” In: Pare, C. (ed.) Metals Make the World go Round: The Supply and Circulation of Metals in Bronze Age Europe. Conference Birmingham June 1997, 160-175. Oxford. Özdoğan, M. 2003. “The Prehistory of Northwestern Turkey. A Synoptic Overview of the Latest Evidence.” In: D. Grammenos (ed. ), Recent Research in the Prehistory of the Balkans, 329-368. Thessaloniki. Pavúk, P. 2002. “Troia VI and VIIa. The Blegen pottery shapes: towards a typology.” StudiaTroica 12, 2002, 35-71. Renfrew, R. 1975. “Trade as Action at a Distance: Questions of Integration and Communication.” In: J. A. Sabloff and C. C. Lamberg-Karlovsky (eds. ), Ancient Civilization and Trade, 3-60. Albuquerque. Sandars, N.K. 1961. “The First Aegean Swords and their Ancestry.” American Jour. Arch. 65, 1961, 17-29. Sandars, N. K. 1963. “Later Aegean Bronze Swords.” American Jour. Arch. 67, 1963, 117-153. Schauer, P. 1971. Die Schwerter in Süddeutschland, Österreich und der Schweiz I. Prähistorische Bronzefunde IV,2. München. Sherratt, A. 1993. “What Would a Bronze Age World System Look Like? Relations between Temperate Europe and the Mediterranean in Later Prehistory.” Journal of European Archaeology 1.2, 1993, 1-58. Sherratt, A. and T. Taylor 1989. “Metal Vessels in Bronze Age Europe and the Context of Vulchetrun.” In: J. Best and N. de Vries (eds. ), Thracians and Mycenaeans. Congress of Thracology Rotterdam 1984, 106-134. Leiden/Sofia. Ulf, C. 1990. Die homerische Gesellschaft. Materialien zur analytischen Beschreibung und historischen Lokalisierung. München. Vulpe, A. 1995. “Der Schatz von Perşinari in Südrumänien.” In: A. Jockenhövel (ed. ), Festschrift für Herrmann Müller-Karpe zum 70. Geburtstag, 43-62. Bonn. Wüstemann, H. 2004. Die Schwerter in Ostdeutschland. Prähistorische Bronzefunde IV,15. Stuttgart. Василева, M. 2008. “Каменна брадва-скиптър от с. Главан, община Гълъбово.” In: По пътя на миналото. Сборник Научни Статиипопов од 65-годишнината на д-р Георги Китов, 61-67. София. Ковачева, T. 1967, “Нова колективна находка от бронзовата епоха при с. Върбица, Плевенски окръг.” Археология 9.2, 1967, 51-59. Панайотов, Ив. and П. Доневски 1977. “Съкровище от късната бронзова епоха от с. Сокол, Силистренско.” Известия Варна 13 (28), 1977, 131-142. Черных, Е. Н. 1978. Горноедело и металлургия в древнейших Болгарии. София. We are very grateful to Emily Schalk for the accuracy and competence with which she conveyed the original text into English. We would like to thank Ms Roxana Doxan (INSTAP, Athens), who happened to be working in the Museum in Varna at the time that the find was drawn, for sharing her experience in drawing numerous swords from Greece with us (see Kilian-Dirlmeier 1993). The way in which the hilt and the grip tongue became detached nor the break on the lower blade can be determined in view of the damages. 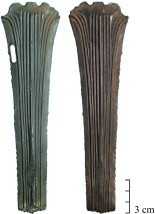 It is indeed noteworthy that swords of the type Karo A, which have been found in the Carpathian Basin and the area of the lower Danube River and are regarded as displaying Mycenaean influence, always have a better patina than the numerous other bronzes of the second millennium BC found in that region (Bader 1991, 18; 28). 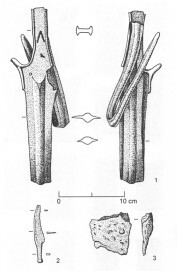 The surface in the area of the grip tongue is rougher on bronze swords (Müller-Karpe 1994, 435). Unfortunately, this particular part is not preserved on our sword. Another possibility for the unequal front and back ribs is that – like the sword from Hattuša, which will be discussed in detail below –, the two halves of the bi-valve mould had shifted slightly (Müller-Karpe 1994, 434). For example, the daggers of type Sempach and Broch (Schauer 1971, No. 1-12), the short flat-hilted swords (Griffplattenkurzschwerter) of type Sauerbrunn and Hochstadt (Schauer 1971, No. 13-19), the Griffplattenschwerter of type Keszthely, Wildon, Dönstedt-Mahndorf and Blengow-Friedrichsruhe (Schauer 1971, No. 320, 322; 323; 326; Wüstemann 2004, No. 9; 19; 20) and a few flange-hilted swords (Griffzungenschwerter) (Wüstemann 2004, No. 268; 272; 274). Nebelsick 1997. Allegedly, the sword from Hattuša was bent prior to its dedication (Ertekin/Erdiz 1993, 719; Hansen 2005, 90). However, the deformation of the sword’s grip alone could have been associated with the procedure of deposition and not carried out intentionally at first. In any case, the hilt is the most sensitive part of the weapon. Kilian-Dirlmeier 1993, No. 1-8. The sword from Jonkovo, which is assigned to this type, is a single find. Sherratt and Taylor put forth a similar idea concerning the hoard from Vălčitrăn (Sherratt/Taylor 1989), which would assign the objects to the Late Bronze Age and Early Iron Age, on one hand. In this case the division is not very convincing, as the metal vessels are stylistically quite alike (uniform motifs and decorative techniques). At least this problem is not present with regard to the daggers and axes from Perşinari. Nevertheless, we must admit that the temporal difference of 500–700 years in the hoard is not easily explained. One example of a hoard containing objects with a range in date of 400 years is offered by the hoard from the acropolis on Lipari (Hansen 2005, 93, and literature cited there). Hoards themselves cannot be seen a priori as the personal possessions of one sole person; they could have equally derived from a society’s accumulation of specific objects, or – even more likely – they were religious motivated find assemblages (cp. O. Hansen 1994, 381-384; Hänsel 1997). On the Aššuwa sword, see Cline 1996. The analogies from Ithaka mentioned above display a completely different execution of the hilt. The Karo-type A sword from Aegina reportedly possesses a hilt-scheme that is similar to that of the sword from Roşiori de Vede (Kilian-Dirlmeier 1993, 31). Cp. Sherratt 1993. Although these terms are not without problem and are far too schematic (Harding 1993), their usage is quite suited to at least emphasise the differences between peripheries (that is, areas that carried on regular exchange of goods with the centres) and margins (in which ideas or objects from the centres arrived only occasionally, but without leading to decisive economic or societal effects). Significantly, B. Hänsel’s basic study of 1976 commences first with the end of the second millennium BC. In contrast to the numerous contacts attested during the Early Bronze Age, half of a casting mould for a socketed axe of the type K-48 according to Černych (Черных 1978, 200) was found only later, after a considerable interruption, in Troy VIIb2. Cp. Renfrew 1975, esp. 8-9, in a strict sense, and Bourdieu 1990, 98-100, more generally. Cp. the discussion in Easton et al. 2002. It may be of interest to supporters of post-processualism that all three authors grew up in a world enclosed by the Iron Curtain and know out their own experience how permeable even this extreme form of border can be, in that in the course of time certain zones of contact emerge between the divided spheres. The higher the state of socio-economic development of a group, the more marked is their territorial behaviour (Bintliff 1999, 511). Hunters/gatherers and stockraisers possess a more flexible concept of their territories (Dyson-Hudson/Alden 1978, 26), between which oftentimes no dividing boundaries can be drawn. Leshtakov 2007, 456. Unfortunately the information provided by Leshtakov about Vratica is very cursory; until the publication of the pottery mentioned by him appears, one must rely upon his statements. He possibly means that there are no comparable finds in Troy: The illustrated fragments (Leshtakov 2007, CXc) resemble forms in Troy solely in their horizontal handles that rise above the rim, but not in the form of the mouth and rim profiles. The forms closest to the illustrated fragments are types A60 and A61 according to Blegen (Blegen et al. 1953, Pl. 292a), which are characteristic for Troy VI early (A61), middle (A60, A61) and late (A60) (Pavúk 2002, 42-44). For the actual state of research, see Hristova 2011, here in ABP: http://www.aegeobalkanprehistory.net/article.php?id_art=19. Bogdan Athanassov, Raiko Krauß and Vladimir Slavčev, "A Bronze Sword of the Aegean-Anatolian Type in the Museum of Varna, Bulgaria.." 26 Mar. 2012. In: Horejs, B. - Pavúk, P. (eds. ): Aegean and Balkan Prehistory. http://aegeobalkanprehistory.net/index.php?p=article&id_art=20 (24 Apr. 2019).